Hannah Nicklin is a writer, producer, game designer, and academic. 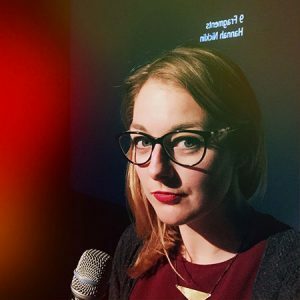 Hannah is most interested in DIY/radical practices, community storytelling, and experimental art and game design. She makes theatre and games in public, activist and community settings, makes public art and games for non-arts/games spaces, and writes critical and creative articles on experimental games for publications such as Rock, Paper, Shotgun, Alphr, BBC’s The Space, and more. She can be supported on Patreon and found on Twitter @hannahnicklin. A Psychogeography of Games was a series of 6 performance talks that sought to explore how the places that mean something to game designers could be seen to affect their game design. Taking the philosophical proposition of psychogeography; that place and situation is subjective and affective and the way we design our environment affects us in return; and applying it to the work of game designers Holly Gramazio, George Buckenham, Kerry Turner, Llaura Dreamfeel, Jake Elliot and Ed Key. Each talk was also a performance in and of itself, often exploring the ideas through form as well as content. E.g. a procedurally generated talk about Proteus, or a discussion of Brutalism where Hannah used sound editing software live in front of the audience to build a soundscape in an open and exposed way.